As soon as he sees her he wants her. Her name is Christine, she is 1958 Plymouth Fury and Arnold Cunningham has fallen head over heels in love with her. Arnold’s best friend Dennis Guilder is not quite so impressed by the rusting car with the custom paint job. Dennis looks at the cracked windscreen and the damaged bodywork, the flat tyre and torn upholstery, and his heart sinks even before he notices the pool of oil underneath the car. Arnie might as well be looking at a different car though. He sees something else. Maybe a little of what the car once was and perhaps a little of what it could be if the work was put in. He is a man in love and first loves can often become all consuming things. There is nothing that Dennis can do to stop Arnie from buying Christine and in the end he goes along with his life-long friend. He lends him some money towards a deposit on the car and even takes him to pick the car up the next day, after work. Sometimes the company a person keeps can have an effect on them and almost from that very first meeting between Arnie and Christine Dennis can see changes in his best friend. Some of them are good, like the fact that his acne seems to be miraculously clearing up. The other changes though, are not so positive in nature. Arnie’s whole attitude takes a turn for the worse and he develops an uncharacteristic mean streak. All of his life Arnie has been the guy who was targeted by the bullies of this world, but when Buddy Repperton takes a jack handle to one of Christine’s lights the worm not only turns, but turns on Repperton leaving him with a bloody nose and a score to settle. As I clocked up the chapters of Christine I saw Arnie’s relationship with his parents and with his friend Dennis start to fall apart; and his relationship with the beautiful Leigh Cabot form and then fail. It was all because of the car and from the very first chapter, as a reader, I was aware that there was something not quite right about that Plymouth Fury. 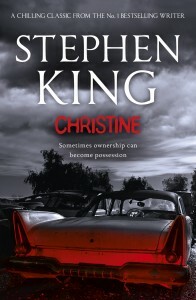 Christine is just a little under 600 pages long. It is written in memoir form and is split into the three parts. “Part one, Dennis Teenage Car Songs”, is written in the first person and from Dennis’ point of View. In part two, “Arnie Teenage Love songs”, Dennis is still telling the story, but it is now written in the third person because all of the events in that part of the book occurred while Dennis was lying in a hospital bed and does not concern things that he experienced first-hand. For part three, of the book, “Christine Teenage Death Songs”, the story returns to the first person perspective because Dennis is on his crutches and out and about, all be it at a bit of a hobble.